This post brought to you by Chase. The content and opinions expressed below are that of Everything Finance. Everyone knows that spring is the best time of the year to buy or sell a house. Real estate and home building experts say that an emphasis on the spring home buying season has its roots in practical reasons, and also in some enduring misperceptions about the marketplace. For one thing, in spring, people who have been cooped up over the winter are ready to bust loose, get out and sample the sunshine. And for many, a potential address change at that time fits nicely with the school calendar. According to a recent survey by Chase, many Americans are poised to get off the sidelines and purchase a home this summer. But do they know the math behind the mortgage? With interest rates topping 4% in June for the first time since November 2014, and speculation that they will continue to rise, now might be a better time than ever to buy. 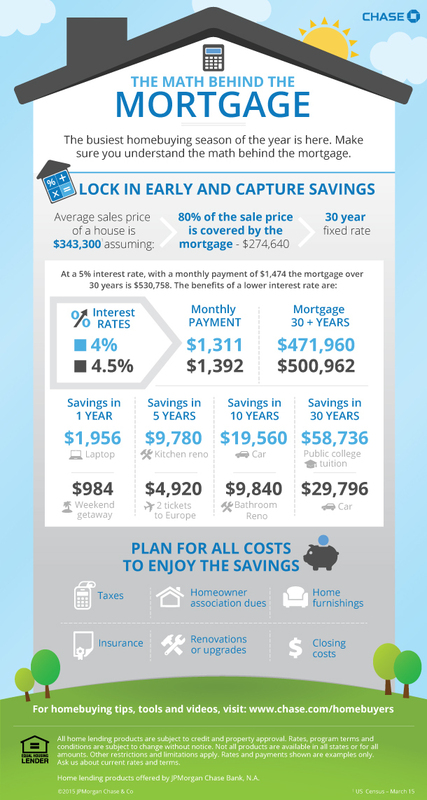 There’s real, tangible savings in getting in while interest rates are still historically low. The numbers don’t lie: Locking in a 4% rate vs. 5% on an average U.S. mortgage would save a homebuyer nearly $60,000 over 30 years! And while interest rates play a key role in the overall cost of buying a home, many homebuyers forget to factor in other costs. Before you close on a house, your mortgage insurer may require a home inspection, which can run several hundred dollars. But even if an inspection is not required, it’s worth paying a professional to evaluate the house so you can avoid spending hundreds of thousands on a train wreck disguised as a house. Your lender may want you to have a professional survey of the property, so everyone knows exactly where your land’s boundaries are. That’s another several hundred bucks. You probably know you’re going to be paying taxes, but it can be easy to forget that you’ll likely need to prepay those taxes at closing. Government recording charges: The cost for state and local governments to record your deed, mortgage and loan documents. Credit report fee: Your lender had to pay to get your credit report; you cover the cost. Flood life of the loan fee: The government tracks changes in your property’s flood zone status; you’ll pay a small fee. Tax service fee: Another pretty minor fee; this service ensures the taxes previously paid on the house are up to date. Lender’s origination fee: This charge is for processing your loan application can be pretty pricey. And finally, make sure to consider homeowners’ association dues, insurance, closing costs and even renovations and home furnishings. Moving into a home can also involve major expenses for packing, storing and transporting your possessions. If you are moving across the country, the costs could be increased. Even moving across town can cost more than you planned for truck rental, movers and equipment. You may need to purchase appliances or furniture for your new home as well. Some items, like your old particle board bookshelves, may not be worth the cost of moving. Again, if you are sizing up, you face the potentially fun, but possibly financially draining, challenge of filling the new place. Trees fall on roofs. Gutters need cleaning. Driveways need repair… A standard rule of thumb is to budget at least 1% of your home’s purchase price each year for home maintenance costs, of course there are services as Palm Beach Roofing Expert that are more affordable for this repairs, but you still need to pay for this. The homebuying process can feel overwhelming, but Chase has a variety of tools that are available to all homebuyers including information about buying a home and a mortgage rate calculator. Visit chase.com/homebuyers for more. You can also view some helpful videos on the Chase YouTube channel.